Musicals.Net - View topic - Song Discussion:"Western People Funny"
I've always considered this to be a very underrated song. Legend has it that WPF was written as a 'throwaway number' to allow extra time to get the Small House setpieces set up. It saddens me a little that so many critics consider this to be such a weak song, because I'd go so far as to say that melodically this song is the closest that Rodgers ventured into Sondheim territory. So, who else loves this wonderful song? Ive always liked the number. it gives Lady Thaing a few more layers as well.. showing her not only wise in affairs of emotional attatchment but also in the ways of the world. Last edited by Salome on Thu Apr 12, 2012 1:48 pm, edited 1 time in total. I really liked this song. It had a nice tune and a bouncy tempo. I will admit, it gets a bit repetetive after a while for me, but I never understand why people describe it as "weak", because it certainly isn't. I think some of the smaller songs like "Western People Funny" and "My Lord and Master" are the best songs in the show. Western People Funny certainly is a clever little song with a cute melody and very funny lyrics. 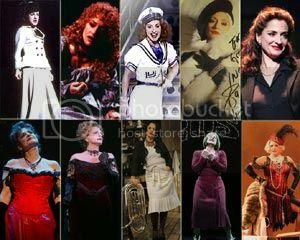 Is it cut often from the show---I don't think it was in the most recent revival with Donna Murphy. I love your opening post, Apples. It's very well-explained and cleverly written. On topic, I also like the number, both for its melody and the reasons that Dawlome gave. Thank you; I'm glad you liked it! I seem to recall that I started that thread on campus and I had to make a class in five minutes, so I had very little time to write an opening post. I had hoped that it wouldn't sound too rushed. Re: Song Discussion:"Western People Funny"
Some have called this song racist and condescending (I think that's why it was left out of the Lou Diamond Philips revival). But I don't see it as such. If anything, it shows that the Siamese ladies have a good deal of practical common sense! In effect, they're saying, "Western women squeeze themselves into uncomfortable shoes, ungainly skirts, torture devices passing themselves off as corsets--and yet somehow WE'RE THE BACKWARD ONES?!"